the Newman Lake Flood Control Zone District (NLFCZD) is managed by Spokane County and is responsible for the lake level control and the water quality of Newman Lake and the control and treatment of invasive species in the lake. Our lake community is represented to the District by an Advisory Board comprised of eight community members. The District was formed 50 years ago and implemented in the 1970s, a level control structure that keeps the lake from flooding during the spring runoff and keeps the lake at a “full” recreational level during the summer months. In the 1990s, an Oxygen and Alum injection system was installed to control the Phosphorus levels in the water. Phosphorus is the primary nutrient source for algae growth. District property owners, which lie in close proximity to the lake currently pay an assessment that funds the annual district budget of about $250,000. A long-term plan must be created for Newman Lake that not only addresses the issues we have today but puts in place a strategy to avoid these problems in the future. We all want stable property values, a clean lake for recreation, and to enjoy the beauty of the lake with the hopes by many, that this setting can be passed on to their children. The Advisory Board is moving to take a more active role in representing you to the district and give you a voice to get answers to some of these questions. The plan is to share lake information with the community, from members that live here in the community, on many of these topics of interest. Your involvement and feedback is very important in this process. November 7th was the second community meeting held by the NLFCZD Advisory Board, at the Grange Hall from 6 to 8 pm. This meeting was structured a little different than “meetings” of the past as community members will be briefing you on a variety of community issues, many of which we need the community’s help and input on. THANK YOU for attending the meeting in our off-season. We appreciate those who attend that are looking to educate themselves on Newman Lake issues. June 21st was the first community meeting held by the NLFCZD Advisory Board, at the Grange Hall from 6 to 8 pm. This meeting was structured a little different than “summer meetings” of the past as community members will be briefing you on a variety of community issues, many of which we need the community’s help and input on. The summer season is almost upon us, and there is a lot going on at Newman Lake. Your community members that serve on the Newman Lake Flood Control Zone District Advisory Board are now tasked with being representative of certain areas of Newman Lake. Each representative would like to invite you to reach out with a few thoughts on your experiences at Newman Lake. The contact information for each representative, region and NLFCZD Advisory Board names are on this page. A region map is located on this page also so you can determine what region you are located. Please email or call with a quick hello and let us know what you are thinking about Newman Lake issues. It can be anything from water quality, erosion, assessments, lake level, non-native invasive species or just to let us know who you are. If you feel more comfortable contacting a representative outside of your district that is acceptable. 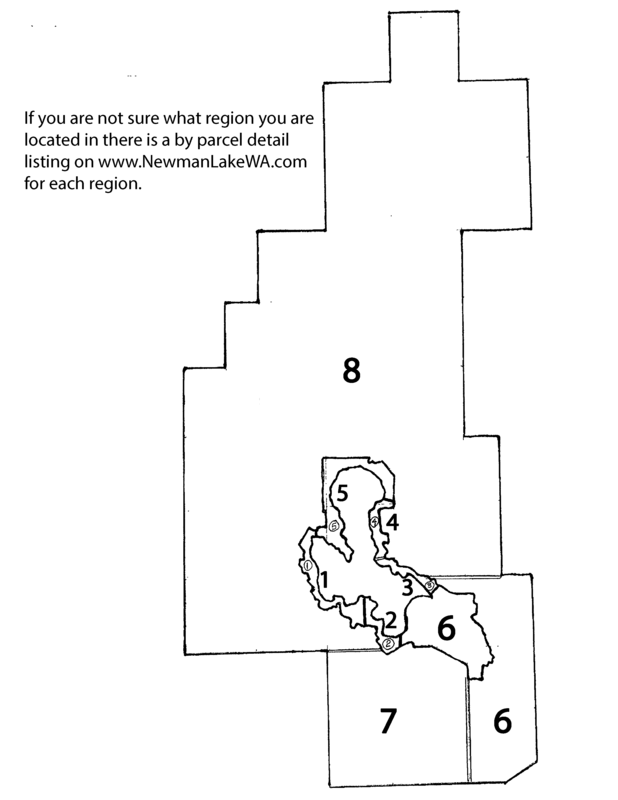 This area includes assessed and non-assessed parcels of the district in the flood plain to the south end of the lake and the non-assessed portions of the district surrounding the lake.